The FSR 402 model is a single-zone Force Sensing Resistor® optimized for use in human touch control of electronic devices such as automotive electronics, medical systems, and in industrial and robotics applications. FSRs are two-wire devices. They are robust polymer thick film (PTF) sensors that exhibit a decrease in resistance with increase in force applied to the surface of the sensor. It has a 14.7mm diameter active area and is available in 4 connection options. 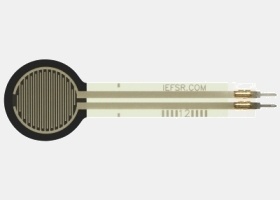 Interlink Electronics FSR 400 series is part of the single zone Force Sensing Resistor family.